If one lives in the southern part of the United States as my husband and I do there is a great evergreen flowering shrub called Indian Hawthorn that you might wish to consider when planning a landscaping project. Not only is it a hardy bush but it is also drought resistant once it becomes established which is especially nice to know. I did not know about the latter attribute (the drought tolerance) when I planted these Spring blooming bushes at our last residence as well as the home in which we now live. For people who have to deal with periods of drought as Texas has experienced on occasion as well as southern areas of the country in which dryness is the normal condition and where water saving xeriscapes are popular, this information is good to know. Oftentimes Indian Hawthorn shrubs are seen planted around commercial buildings and even in highway medians. It makes sense since they do not require as much care as high maintenance plants would require. The Indian Hawthorn known as Rhaphiolepis indica comes from the family of plants called Rosaceae which is part of the Rose family. South China is where the species originated. In the United States Indian Hawthorn plants are best grown in zones seven to ten. While some winters are warmer or cooler than others, generally these defined planting zones which were developed by the Department of Agriculture in the U.S. refer to the lowest normal temperatures as a gauge as to where plants of all types should normally survive growing. Other conditions such as soil, rainfall and other factors might impact a plants hardiness but knowing about these planting zones this gives people a general idea as to a certain plants viability if grown in their part of the country. Zones 7 to 10 hug both coastlines up to around the Cape Cod area on the east and all the way up to the Canadian border on the west. The zones 7 to 10 dip down to the states of Arkansas and Oklahoma and in general for all of the southern states bordering the Gulf of Mexico and the Country of Mexico. If you are interested check the USDA hardiness zones to see if you can successfully grow Indian Hawthorn shrubs in your area of the country or world. What I like about the Indian Hawthorn shrubs in addition to their putting on a magnificent flowering show each springtime is the fact that they remain evergreen. They keep their leaves at all times of the year. The thick dark green leaves some of which can turn a bit orange to reddish in the winter also have bluish to black looking berries on the shrubs which our avian friends like to feast upon. 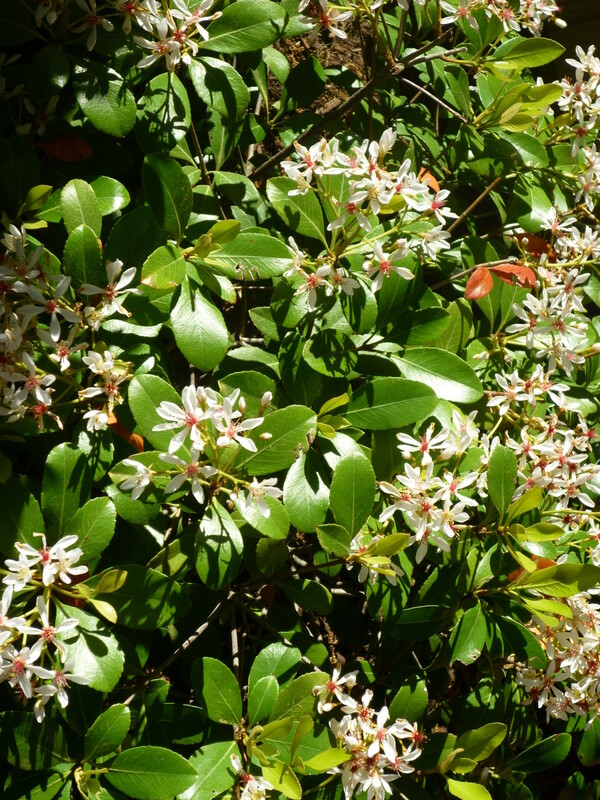 So from their showy and fragrant white to pink flowers in the springtime of the year (attracting bees and butterflies) which literally color the entire shrub as the flowers poke up in clusters above the leaves, to summer, fall and winter, this is a wonderful evergreen shrub to have in one's landscape. Caring for an Indian Hawthorn perennial shrub is really easy. It likes full sun but will tolerate some partial shade. In Galveston and along the coastlines, it is especially nice as it can also tolerate the sandy soils and can withstand a little of the salt spray. In general these shrubs like moist well drained soil but as already mentioned they can also tolerate some drought conditions once they become well established if the drought is not too prolonged or severe. In the latter case a little extra help by human intervention and watering every week to ten days or so should keep the Indian Hawthorns alive. I have used it as hedges and as foundation plants in our home landscapes. 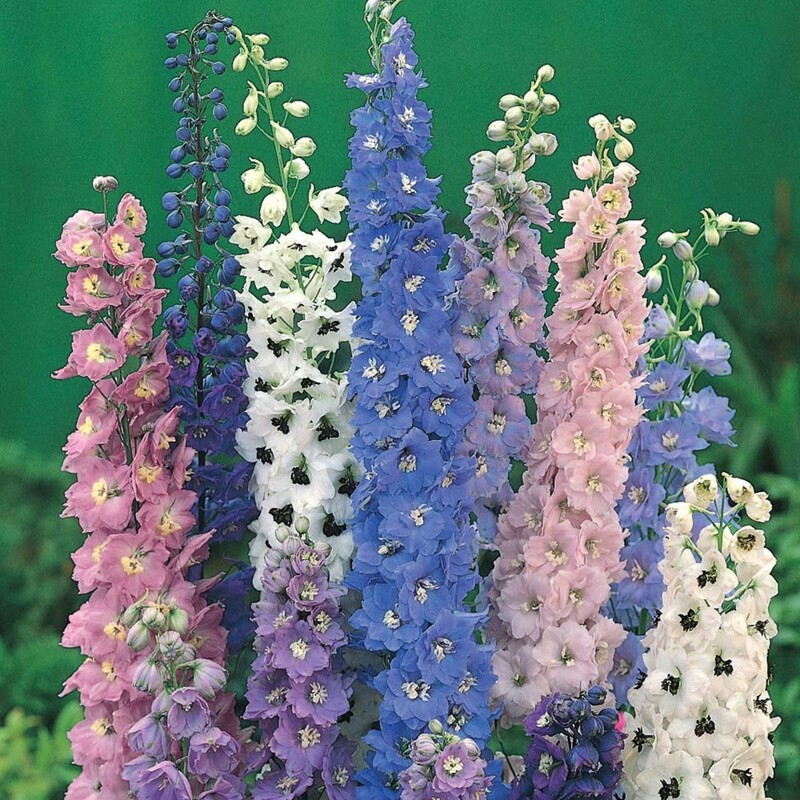 It needs little trimming as it generally grows in a compact and dense mounded form getting anywhere from three to six feet tall and just about as wide depending upon which type one has planted. Generally trimming an occasional shoot that springs up above the rest is all that is needed to maintain a pleasing overall form. If hedging it to a specific height do it right after it has finished blooming so as not to adversely affect next years flowering seasonal show. 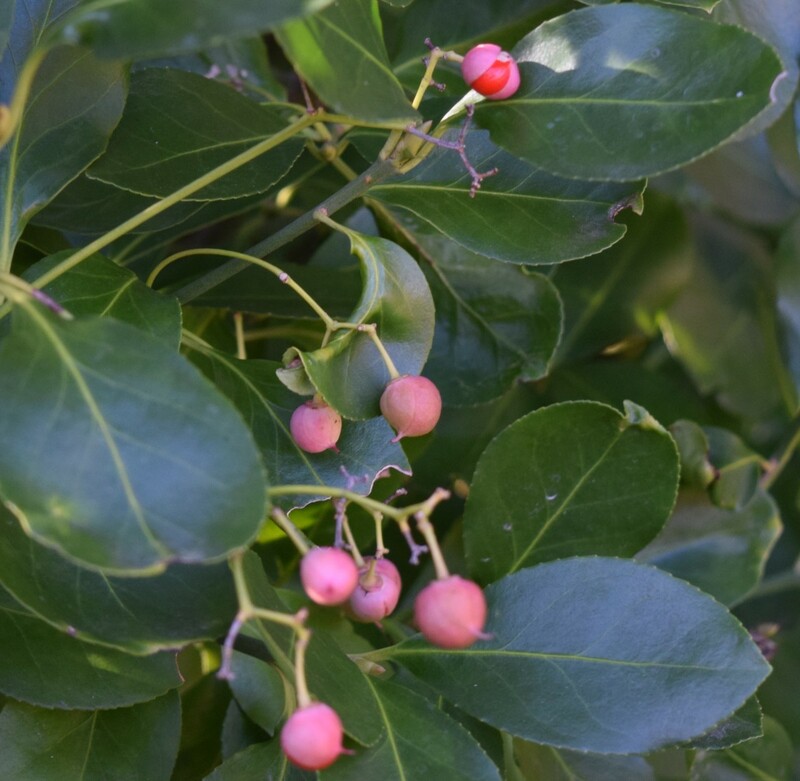 Depending upon which type of Indian Hawthorne is purchased some can be trimmed up in appearance to resemble a small tree which can be quite effective when planted in large pots or garden settings with lower plants or even grass surrounding the base of the plant. 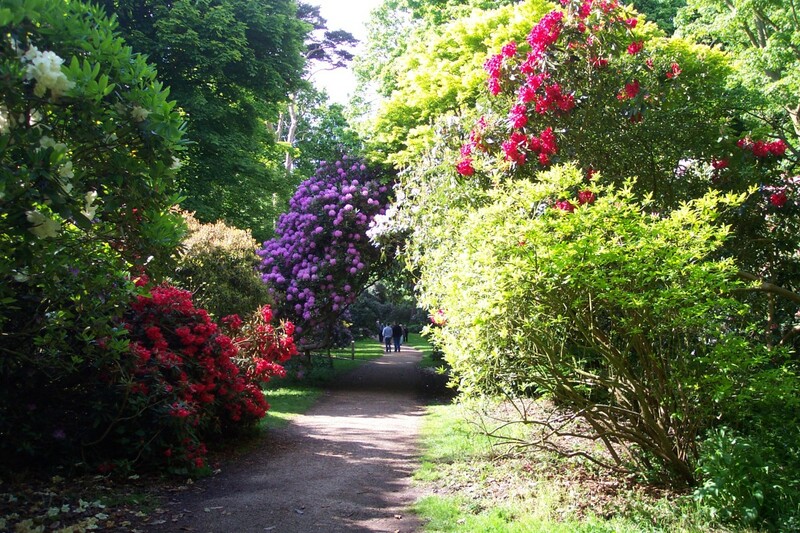 Indian Hawthornes and azaleas often bloom at the same time of year making for a beautiful vision of loveliness. 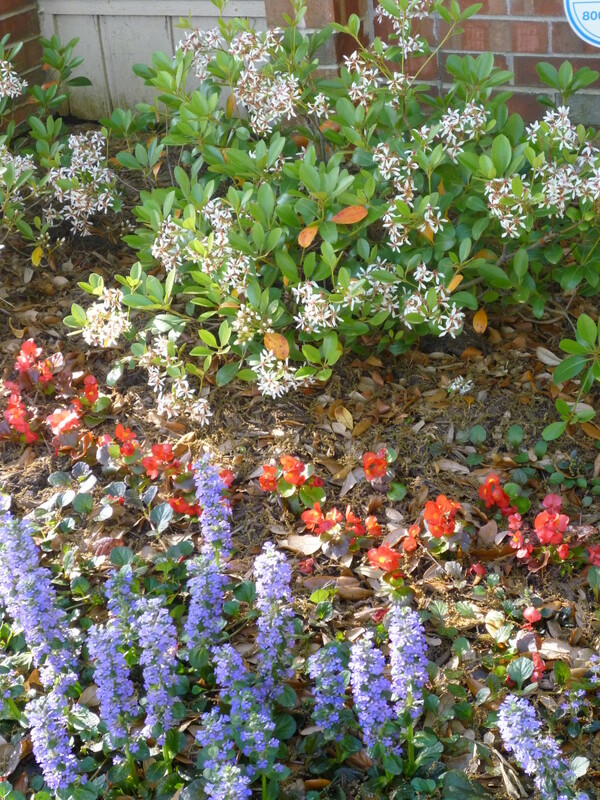 Fertilize after blooming with the same type of fertilizer as one would use for azaleas. Leaf spot can affect the leaves of Indian Hawthorn plants but in my personal experience it has never been much of a problem. Here are a few additional things you might wish to know about the Indian Hawthorn plant. The berries are attractive to birds. Some people also use the berries to make homemade jams. Deer like munching on Indian Hawthorn bushes. In cases like that perhaps you would be smart to plant more deer resistant shrubs. For all other people living in moderate planting zones the Indian Hawthorn might just be the perfect evergreen flowering shrub for your landscape. This video shows a lovely yard with many Indian Hawthorns in bloom. Should Indian Hawthorn shrubs be fertilized? Ideally, the Indian Hawthorn shrubs should be fertilized each spring lightly with an all-purpose fertilizer. If soil conditions are not ideal, the shrubs will benefit from another application of fertilizer in the fall. When do Hawthorne’s bloom? Mine needs to be cut down. In the Houston area the Indian Hawthorne shrubs are in bloom around the same time as the azaleas which is in the spring of the year. Our annual azalea trail is in mid-March. Depending upon the winter conditions it can be a bit earlier or later but that should give you a general idea of timing. I just saw several Indian Hawthorns on sale at a Home Depot. They had quite a bit of leaf burn but otherwise looked healthy. What do you think their chances of recovery are? If you are sure it is merely leaf burn, I would go ahead and purchase them. Indian Hawthorns are generally disease resistant and if planted in a well-draining soil can survive just about anything. Entomosporium leaf spot is characterized by small red to maroon spots on the leaves which occasionally are surrounded by a yellow circle. It is usually caused by very wet weather or overwatering when the weather is warm. Treatment can be as simple as trimming off and getting rid of the affected branches or treating it with a fungicide. It will generally not kill the plant, but if it is leaf spot, can be spread to other nearby Indian Hawthorn plants by the splashing of water on the leaves and being transferred to a nearby plant. I don't know if you can still find them in nurseries at this time of year. 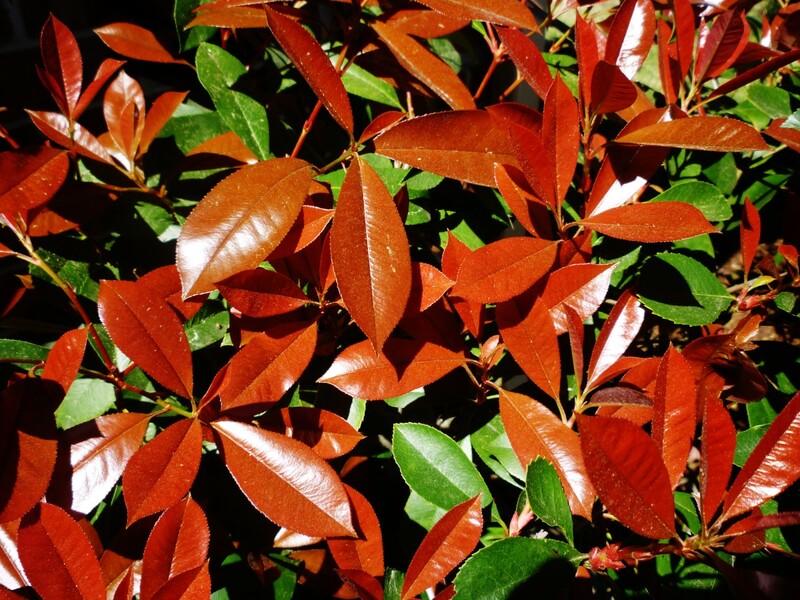 Fall is a great time to plant shrubs if the holes are prepared properly and then the plants are mulched. Odds are that spring will be your next option. The only good thing about that is that you will be able to see the color of the blossoms in case the tags have somehow been removed. Good luck! When is it best to plant Indian Hawthorne in north Texas? 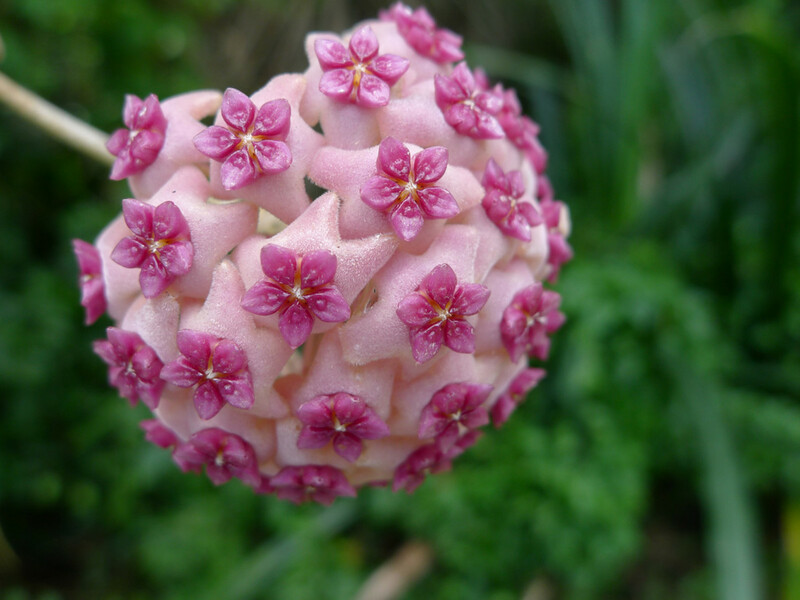 If your plants are healthy they should eventually bloom generally in the Spring. You might check with the nursery where you purchased them. They only bloom one time a year...so that is another possibility. Perhaps they have not been planted long enough? It certainly is a beautiful shrub and an interesting to read. It's good to know that the berries can be used to make jam. Voted up, useful and interesting. Shared, pinned and tweeted as well. Rated 5 stars. Indian Hawthorne are so pretty wish I could grow them in this area. Lovely hub. Voted up and sharing. Thanks for the share on this hub about the hardy and beautiful Indian Hawthorn plants. 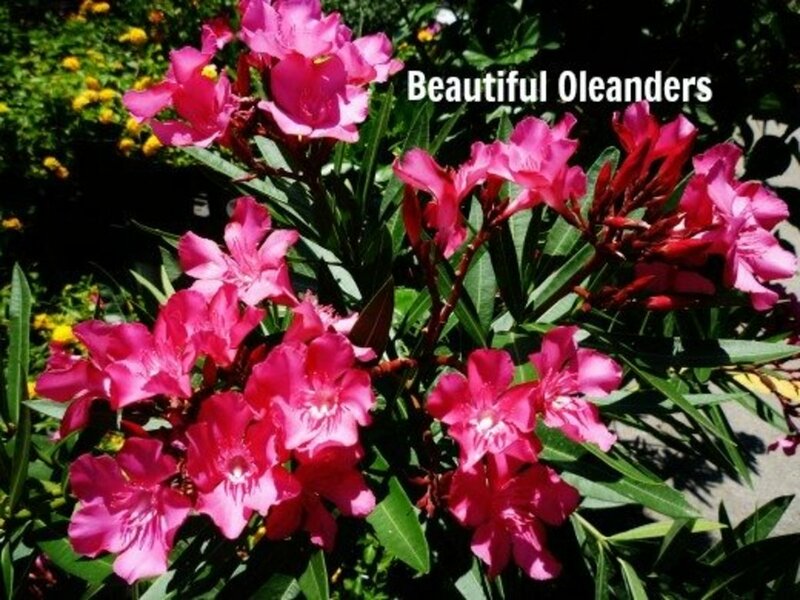 We have many of them utilized in our landscaping around our home. I really enjoyed this hub the first time and I think it's so packed with great information about a shrub that is perfect for low rainfall areas. Both tough and pretty. Have to say again, beautiful photos! Will share again. It is nice that Indian Hawthorne shrubs do not necessitate lots of water because as you said, it seems Texas has certainly been suffering from a lack of normal amounts of rainfall the last couple of years. Some of the dead trees in an undeveloped area about a block from our home on the other side of a major street are slowly falling down. Looks tough and would be quite a fire hazard were it ever to ignite. Glad that you liked the information and photos. Appreciate your feedback, votes, etc. This looks like my kind of shrub. It's pretty, doesn't require a lot of fussing, and handles drought well, which seems to be becoming a permanent thing here in N. TX. Lots of great photos as usual, and it would seem you're quite the gardner as well as artist/photographer. Voted up, IUB, 5 more stars, and will share! How wonderful it will be to have a wrap around porch! These Indian Hawthorne plants would be a nice foundation plant for you as well as offering blooms in the Spring. Appreciate the votes and especially the share. Thanks! I would think that Indian Hawthornes should do well there as the USDA growing zones are from 7 to 10. Check with your local nurseries to make sure. Ours are starting to bloom now along with our azaleas. Such a pretty time of year here in Houston! Thanks for your comment. I like drought-resistant shrubs, especially flowering ones. Do you know if these are available in Southern California? Voting this Up and Useful. Undoubtedly the birds who would have eaten the berries helped spread their seeds which is why they are now growing wild. Thanks for your comment on this Indian Hawthorne hub. Very happy to be able to introduce the Indian Hawthorne plant to you via this hub. Appreciate your comment. Glad that I could bring the Indian Hawthorne shrub to your attention. We really enjoy using it in our home landscaping. Thanks for your comment and votes. A completely new shrub to me, but utterly beautiful and exquisite. I look forward to sharing this one with my husband/ adding to my bookmarks to explore further. Wonderful and comprehensive presentation-- voted UP & UABI, mar. So glad to hear that you found this of interest. Thanks for your comment regarding the Indian Hawthorne and thanks for the votes up. Appreciate it! Thanks for your comment on this Indian Hawthorne shrub hub. Always enjoy your writings as well. Glad you found this Indian Hawthorne hub while hub hopping and nice to know that you enjoyed it. Thanks for your comment. I wished I would have used Indian Hawthorne instead of Knock Out Roses when I redid the landscaping last year. Your yard always looks wonderful! Another gem that you are sharing with us on here. Your hubs are always so beautiful natural. Great work and have a nice day. Hi found you while hub hopping!! the pics are just amazing and loved the loads of information given here. While the Indian Hawthorne shrub only blooms in the Spring it at least provides nice greenery the rest of the year as you have seen at our house. More people may become interested in the drought tolerance in our area since Texas has been devastated by a severe drought this year of 2011. If they are replacing plants, they might want to give this shrub a chance. Thanks for your comment. 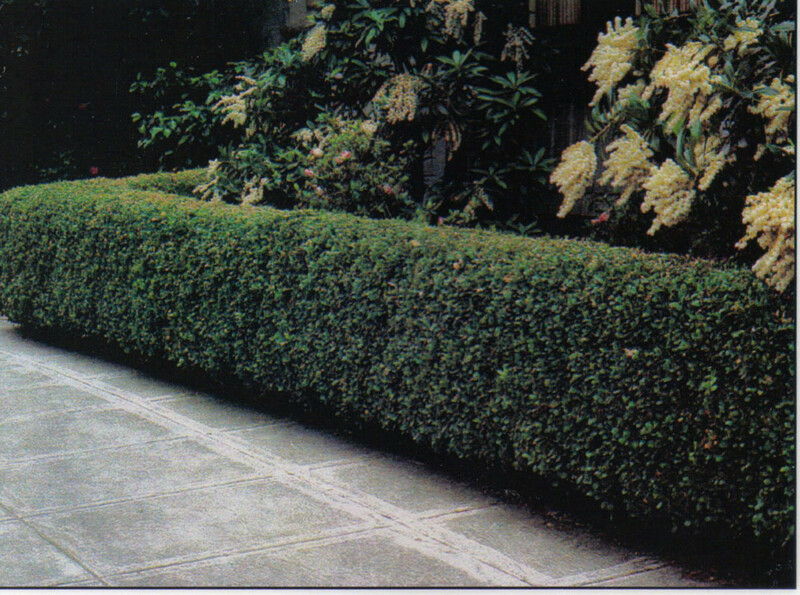 We have always had great results with Indian Hawthorne plants here in Houston. I just give them a shot of azalea food after they bloom each year and they seem to do well. Are yours in full sun or shade? They like full sun and will tolerate partial shade which we have now in this house. Sorry you have had mixed results. Thanks for your comment. Another great hub. The Indian Hawthorn is a very beautiful evergreen shrub. It is good to know that this is a low maintenance shrub and is drought tolerant. 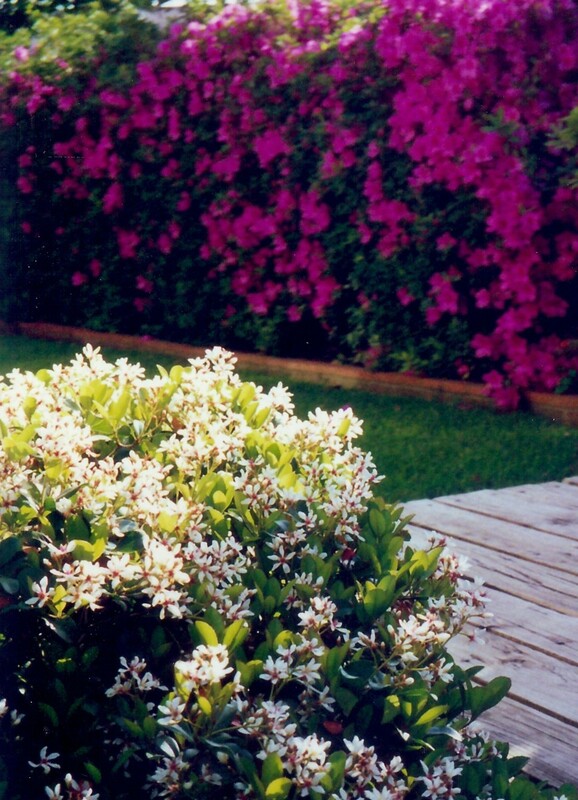 Your yard is truly beautiful with the tiny white flowers adorned by each shrub. 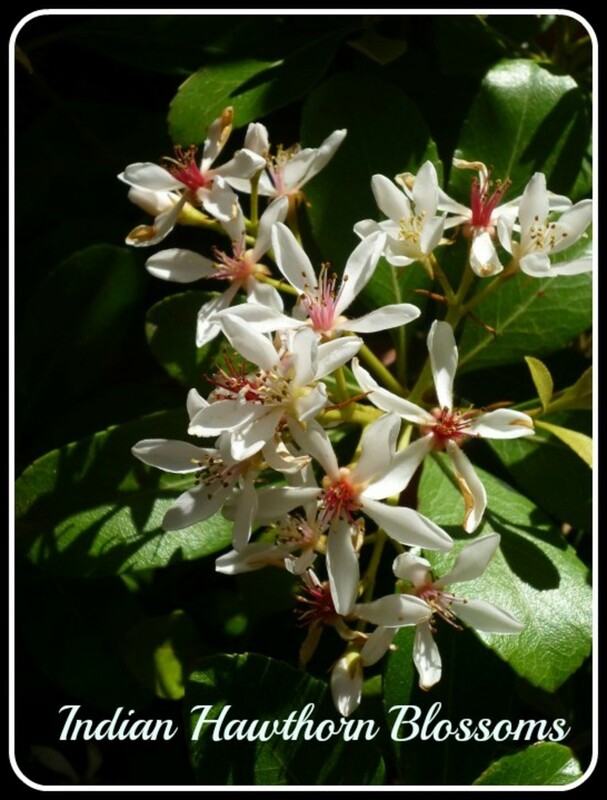 Great information, photos and videos of the lovely Indian Hawthorn Evergreen Shrub. I have some Indian Hawthorne and I've had mixed results with it. Lost some bushes for no apparent reason and blooming problems with others. It is a lovely shrub when it's in the right place and has a good Gardner to to keep it healthy.